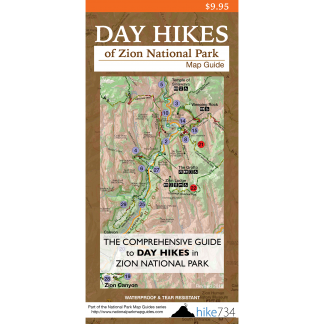 This hike takes you to a nice vantage of Zion Canyon. 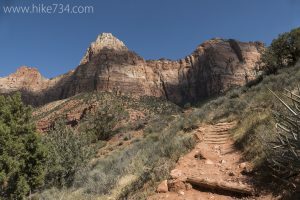 The Watchman Trail begins by briefly following along the Virgin River in the shade of the cottonwoods, then out in the sun for the majority of the hike. From the Zion Canyon Visitor Center, you follow the eastern shore of the Virgin River and head upstream on a paved path. Following the signed route, you cross a road and begin working your way past staff housing to the knoll below Bridge Mountain. From here, limited shade and a rocky path take you through junipers, a variety of desert vegetation, and flowers. Scrub Jays squawk at you as they bounce around the shrubs. The cliffs and rocks above you are fantastic as you take your time gaining elevation. Pockets of shade are welcomed and are popular resting spots. A little seep in the rock provides a trickle of water that supports the growth of diverse plant life. Eventually, you climb out of the canyon where you have gained most of your elevation and the views open up to the entire canyon in both directions. The trail drops some to a nice vantage and the end of the trail. A side trail loops you back to the main trail, slightly changing the scenery. After joining back up with the main trail, you work your way back down to the Visitor Center the same way you came up. Trailhead: Park at the Zion Canyon Visitor Center and head towards the vehicular bridge over the Virgin River. The signed trail starts across the road, but on the same side of the river as the visitor center.